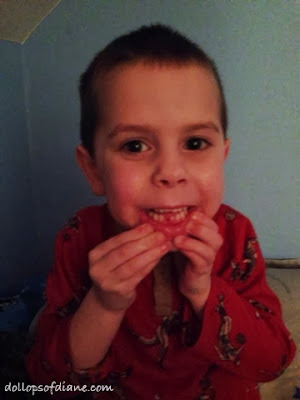 Dollops of Diane: Henry's First Lost Tooth! Henry has had a big couple of days. He turned the big FIVE on Friday and then lost his first tooth last night. His bottom two front teeth have been loose for a couple of months but I didn't realize that they were THAT loose. Last night, I said goodnight to the kids and had barely made it to the bottom of the stairs before Henry started yelling/crying "Something happened to my tooth!!" I ran up to find him in his bed with blood all over his shirt and hands. Umm..hadn't I JUST left the room. How did things get so messy so quickly?! I assured him that sometimes it bleeds when your tooth falls out and that he was fine. Then the excitement kicked in and he was psyched. Santa and your first visit from the Tooth Fairy in less than a week? That's the kind of stuff dreams are made of.